Sheep horns are hollow with a bony center that attaches to the skull. 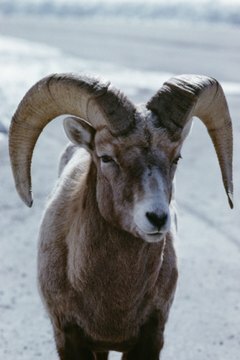 All rams -- male sheep -- have horns; many female sheep do, too. Unlike the horns of some other animals, sheep horns tend to curl rather than point straight out. Few sheep owners completely remove the horns of their sheep unless they're causing health problems. Trimming a ram's horns, however, can make handling safer for the sheep and the owner. Determine whether or not your sheep's horns need to be trimmed. There's no particular length at which a horn is considered dangerous. If a horn is growing so close to the animal's face that it may injure its eyes or make it a struggle to eat, the horns need to be trimmed. They should also be trimmed if your sheep is behaving aggressively and using its horns to injure you or other sheep. Distract the sheep with treats and affection. It's best to have two people present to trim the horns to keep the animal calm and avoid injury. One person should give the sheep treats while the other trims the horns. Use the hacksaw to slowly saw off the ends of the horns. It's safest to saw off small sections at a time rather than attempting to remove the horn entirely in one cut. You'll avoid cutting your sheep with its own horn if you work slowly; you'll also decrease the likelihood that your sheep will panic. Sheep don't have feeling in their horns, but they can feel it when someone tugs and pulls on them. They may have sensation where their horns join their skulls, so don't trim horns this short. Cut vertically into the horns if they're growing too close to the face. You'll want to cut down the side of the horn closest to the eyes and mouth while leaving as much of the horn intact as possible. Sand the edges of the horns after you've finished cutting. This ensures that the horns won't splinter, break or cut another sheep. If the horns appear to have an infection, are swollen or are otherwise causing the sheep pain, don't trim them yourself. Your sheep needs veterinary care.